Early mission of Cassini encounters with the moon, the northern terrain of Enceladus was masked by wintry darkness. Now that the summer sun is shining on the high northern latitudes, scientists will be looking for signs of ancient geological activity similar to the geyser spouting, tiger-stripe fractures in the moon’s south polar region. It’s been reported that analysis of the out-gassing suggests that it grows from a body of sub surface liquid water, which along with the unique chemistry found in the plume, has fueled conjectures that Enceladus may be the most habitable spot beyond Earth in the Solar System for life. Most of the data and photography from visiting spacecraft has been acquired by the Voyager 2 and Cassini spacecrafts. Mission scientists announced evidence in March that hydrothermal activity may be occurring on the seafloor of the moon’s underground ocean. In September, they broke the news that its ocean previously thought to be only a regional sea. During this encounter, Cassini will make its deepest ever dive through the moon’s plume of icy spray by collecting images and valuable data about what is going on beneath the frozen surface. 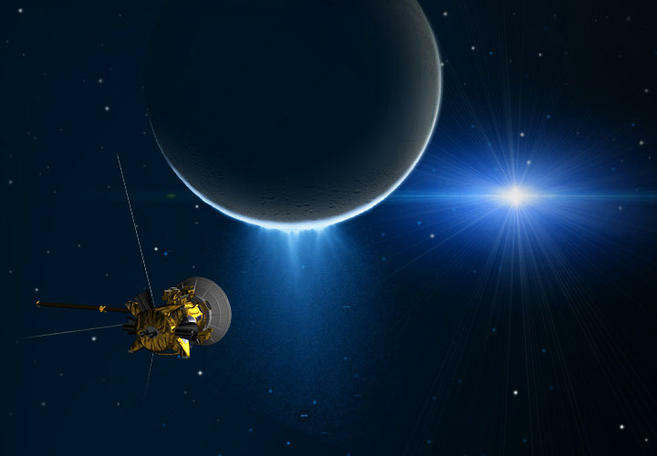 14 encounter will serve as a prelude to the main event in October, a flyby of Enceladus on Wednesday, Oct. 28, during which Cassini will come dizzyingly close to the icy moon by passing a mere 30 miles above the south polar region of moon. We have been following a trail of clues on Enceladus for 10 years now,” noted Bonnie Buratti, a Cassini science team member and icy moons expert at NASA JPL. The amount of activity on and beneath this moon’s surface has been a huge surprise to us. We are still doing effort to figure out what its history has been, and how it came to be this way. Cassini’s final close flyby on Dec. 19 will examine how much heat is coming from the moon’s interior from an altitude of 3,106 miles. We will continue observing Enceladus and its singular activity for the remainder of our precious time at Saturn, added Linda Spilker, Cassini project scientist at JPL.